Aishwarya Rai is a former model turned actress that is best known for winning the 1994 Miss World beauty pageant before going on to star in films like Jeans (1998), Hum Dil De Chuke Sanam (1999), Kandukondain Kandukondain (2000), and Devdas (2002). The talented actress, who has won several honors for her acting and went on to become the first actress of Indian origin to be a jury member at the Cannes Film Festival, is also a recipient of national honors from the government of India and France. In 2009, she was awarded the fourth-highest Indian civilian award, the Padma Shri, and in 2012 was awarded the French national order, the Ordre des Arts et des Lettres, both for her contributions to art. The multiple most beautiful Indian woman list entrant is also lauded for her humanitarian work, which has led her to be named a Goodwill Ambassador for the Joint United Nations Programme on AIDS (UNAIDS). Aishwarya Rai was born on the 1st of November 1973 to father Krishnaraj and mother Vrinda of the Bunt Community in Mangaluru, Karnataka, India. Her father worked as a biologist with the Indian Army while her mother was a homemaker. Despite spending her early years in Karnataka, Rai grew up in Mumbai where she attended the Arya Vidya Mandir High School and then the Jai Hind College before transferring DG Ruparel College in Matunga. Rai had hoped to either become an architect or have a career in medicine. She went as far as enrolling at Rachana Sansad Academy of Architecture before later opting to focus on modeling. Aishwarya Rai’s first notable modeling gig was in 1991 when she won the Ford Motor Company organized international Supermodel Contest which led to her being featured in the American magazine Vogue. Two years later, she appeared in a Pepsi Commercial that made her very famous before going on to contest the 1994 Miss India Pageant which she was runner-up in before going on to win the Miss World Pageant. Aishwarya Rai is one of those people who believe in maintaining close relationships with family. She has over the years made sure to keep her immediate family; father Krishnaraj Rai, mother Vrinda Rai and brother Aditya Rai, who is a merchant navy engineer, very close to her as they have been frequently spotted by their daughter’s side on the red carpet and at other social events. In 2003, the trio of sister (actor), brother (co-producer) and mother (co-writer) collaborated in the Hindi romance movie Dil Ka Rishta which was a huge box office hit. Tragedy, however, struck the family in March 2017 when Rai’s father passed away following a long battle with cancer. Aishwarya was frequently seen visiting her father in the hospital as she canceled all appointments and professional trips to be by her father’s side during his final moments. Aishwarya Rai is married to actor Abhishek Bachchan, the son of legendary Indian film actors and politicians; Jaya Bachchan, an actress turned politician, and Amitabh Bachchan, who ruled Bollywood in the 70s before becoming a politician but still continues to act, most recently appearing in The Great Gatsby (2013) and Piku (2015). Abhishek, who was born on the 5th of February, 1976, in Mumbai, is best known for movies like Yuva (2004), Kabhi Alvida Naa Kehna (2006), Dostana (2008), Bol Bachchan (2012), Happy New Year (2014), and Housefull 3 (2016). Bachchan was reported to have fallen in love with Rai while they were filming the action thriller Dhoom 2 (2006) although they had known each other for a while and had previously appeared together in a number of other movies. The couple went public with their engagement in January 2007 and went on to tie the knot a few months later in April 2007. 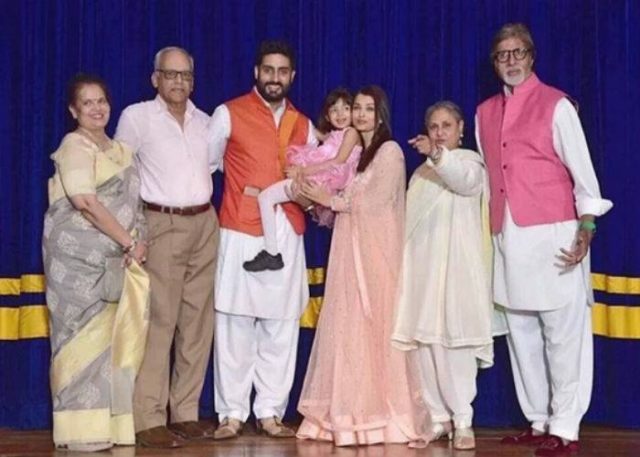 The duo, who have been described as a super couple by the Indian media, welcomed their first child, a daughter named Aaradhya Bachchan on 16 November 2011. The former beauty pageant winner is considerably tall for a woman with a height of 5 feet 7 inches (1.7 m) which 2 inches taller than the height of an average woman and a whopping 7 inches taller than the average Indian woman.